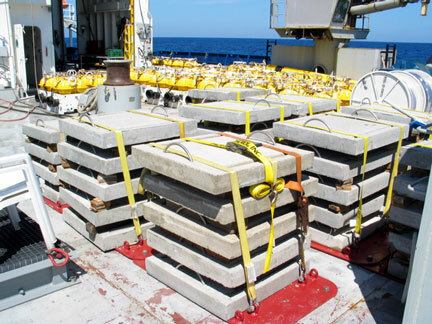 To sink the instrument and hold it stable on the seafloor, we use a concrete anchor approximately 1 m square and 8 cm thick having an air weight of slightly over 200 kg. The instrument is held onto the anchor by passing a stainless steel strap through the two loops cast into the anchor. The loop assembly is simply made of two half-circles of bar welded onto two flat bars to maintain the spacing and provide a modicum of reinforcing. No other reinforcing is necessary. The loop assembly must be made of non-magnetic material, usually non-magnetic stainless steel. The two grooves in the top surface prevent lateral motion of the instrument when it is mounted on the anchor. The sides of the anchor may be bevelled for easier release from the mould, or may be straight. Drawing # 15-003: updated drawing with the new dimension of 32 x 32" to simplify the parts manufacturing for the internal cross members. All are now the same length. The internal frame now rests on the base of the mold to allow for a simpler concrete pouring approach, no longer does it need to be held up off the base. The height of the concrete was adjusted to maintain the anchor weight. The loops have a slightly smaller diameter to prevent capturing the release cable in the corners. But the overall loop height above the concrete remains the same. Drawing # 15-002: some of the same adjustment were made for the old anchor dimensions for people with the old wood molds. 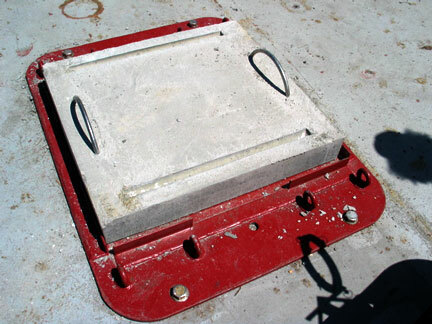 A concrete "sea slab" anchor on deck inside a steel launch plate. 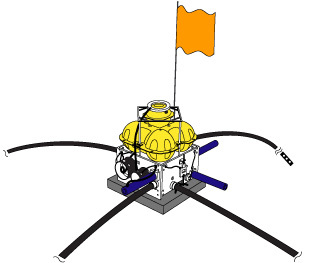 The launch plate serves to secure the anchor on deck while the instrument frame is placed on top and readied for deployment. Stacks of anchors five high are secured to the ship's deck using red colored metal plates and aircraft straps.